Lyda Catherine Ambrose was born in 1891. Little is known about her childhood and upbringing. She first appears on our radar in 1917 when her fiancee died suddenly and in great pain and Lyda came into a $2,000 insurance policy, courtesy of his insurance policy. Hardly observing a decent period of grieving, Lyda next turned her attention to her fiancee's brother and married him within few days of his brother's death. Within three months he was dead, making his widow $2,500 richer. Lyda moved next to Twin Falls, Idaho, where a restaurant owner fell for her charms. They married on June 10, 1918. Shortly after, the unfortunate man dropped dead dead from "stomach ulcers." Unfortunately for Lyda, she’d been negligent this time around. Her husband’s life policy had lapsed and she got nothing. She made no such mistake with victim number four. Just three months after the nuptials, the man dropped dead and Lyda collected $10,000 dollars on his policy. Her next victim was dispatched even faster. He survived just a month of being married to Lyda before he died in November 1920. A $12,00 policy had been taken out on his life just a month earlier. But Lyda had pushed her luck to far this time. Once the police were made aware of her terrible luck with husbands, an investigation was launched. When a search of her home turned up large amount of arsenic-laced flypaper, exhumations were ordered and autopsies carried out on the victims. They were found to have died of arsenic poisoning. Tried and found guilty of first degree murder, Lyda Ambrose was sentenced to life in prison. She escaped in 1931 but was recaptured a year later and eventually died behind bars. 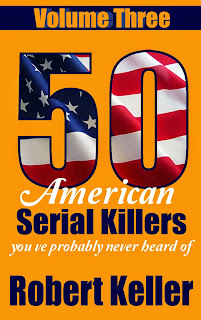 50 American Serial Killers You’ve Probably Never Heard Of Volume 3.